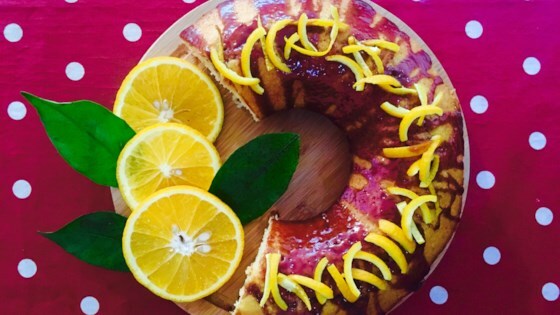 "This quick orange cake is delicious without the frosting. I sometimes just sprinkle icing sugar on the top. This recipe can be used to make two 8-inch cake layers or a 9x5-inch loaf. If making a loaf cake, bake for 60 minutes." Preheat oven to 350 degrees F (175 degrees C). Grease and flour two 8-inch round cake pans. In a measuring cup, combine milk, 1/2 cup orange juice, oil, beaten eggs, and 1 1/2 teaspoon orange zest. Set aside. Divide batter into prepared pans. Bake in the preheated oven for 35 minutes, or until a toothpick inserted into the center of the cake comes out clean. Allow to cool. The egg flavour totally overwhelms the orange taste in this. Three eggs is a lot, and although the cake was moist, it was a bit too crumbly. It has a scrambled egg/cakey taste for me.